There is a common misconception that milking procedures are the most important aspect when producing raw drinking milk (RDM). Although it is important, this is not the most vital aspect. The health of the animal is the most important factor, because healthy animals are unlikely to carry pathogens in their manure, or be susceptible to bacterial- or udder infections. This is discussed in the other risk categories, like Cow Health. good and bad, that may be present in the milk. This means that, arguably, there is little need for the intricate hygiene precautions necessary for raw drinking milk (RDM). Read this article for more information: Two kinds of Raw Milk. Raw milk produced with the intention to be consumed raw can take four times longer to produce in a regulated system. There is a benefit for the farmer in starting with a small herd; they can grow in confidence. This milk is valuable, which is why it is a niche market for the small-scale farmer. Larger dairies do exist. The largest producer in the U.S.A has a milking herd of 500. Organic Pastures Dairy has been operating since 1999 and had plenty of time to develop appropriate procedures and risk reduction strategies for their operation size. Their food safety plan has served them well. Hygiene during milking can make a significant difference in the milk quality. The milking area, the equipment, the animals, and even the dairy farmer need to be as clean as possible right before starting. This can reduce the risk of contamination dramatically. Long udder and tail hair are best trimmed to minimise risks. Hair from the flanks and bellies can be trimmed as well to help prevent clinging soil or faeces. The animals must show all the signs of good health. The Alternative Milking Initiative has an easy to understand list detailing essential before-, during- and after milking steps. A Massachusetts organisation also has a free Raw Milk Producers Handbook with detailed information about milking procedure. 1. The cow's teats are often first hosed down with water. Some see it as very risky to wash the entire animal because water dripping down can also collect bacteria on the body and move them towards the udder. Some consider it best practise not to spray water above the cow's teats when washing before milking. If this cannot be avoided extra care must be taken to ensure all of the udder is dry before attaching cups. All the cow's teats have to be visually cleaned from dirt with a wet washcloth treated with a pre-dip solution, see a video example here. Dry towels are not always adequate to remove the dirt and bacteria during this essential first wipe. Remember that wipes or cloths should never be shared among cows; each must have their own to avoid potentially transferring bacteria. Then each teat should receive a pre-dip, which is usually iodine-based. This video by dairy coach Tom Wall, shows why it's a crucial mitigating practice to ensure the entire teat is covered with pre-dip and why it's crucial to allow contact time of at least 30 seconds to allow the killing of any bacteria. 2. Each teat should receive a forestripping, and it is also useful to work the disinfectant into the entire teat area. This will also start the oxytocin response which will result in the let down of milk. (Forestripping or fore-milking is the process by which the first three to five streams of milk are expressed from each teat before to milking.) It is also one of the best ways to detect mastitis (infection of the udder) and other anomalies early. Forestripping also expels the milk that was furthest down in the gland, that is closest to the teat end, that is often high in somatic cells. Removing the first bit of milk will also result in a lowered overall somatic cell count in the milk that is harvested. Image: the CMT(California Mastitis Test). The CMT paddle can be used if the milker suspects a cow has inflammation or abnormal milk. It can be used for rechecking as well. It allows the milker to inspect the milk coming from the individual quarters of the cow's udder to identify which teat has infection or abnormalities. See this video to learn how it works. 3. Then each cow's teats have to be dried with their individual towel. The re-use of a towel from one cow to the next can spread undetected mastitis-causing pathogens form cow-to-cow. Sponges should not be used as they can harbour pathogens (even after treatment with disinfectant they are still not suitable). This short video shows why these mitigating practices for udder health is so important, no matter if the milk is produced for the pasteuriser or for human consumption. Image: the teats are being wiped after allowing the iodine solution to eliminate any microbes. The iodine solution is usually a deep yellow colour and has a strong, distinctive smell. 4. It is good practice that the time between first contact and the attachment of cups should be less than 90 seconds. The milking unit/cluster has to be handled and attached with specific care not to touch the legs or the ground. It has to be removed again when milk flow has ceased. If a cow defecates and soils milking equipment the process of milking has to restart from the beginning. Soiled areas on the milker and the equipment must be adequately cleaned before re-attaching the cluster onto any of the cows. Don't over milk cows producing for the RDM market as it can cause stress to the glands. It is well known in the industrial dairy industry that milkers often don't clean the teats properly when producing raw milk meant for the pasteuriser. There is an expectation that the milk will be 'cooked' and sterilised therefore it will be safe. In this video there are three snippets showing milking cups being attached to dirty teats. This is unacceptable when producing for the raw dairy market. If you need better lighting in the milking parlour to perform these duties adequately, invest in a headlamp for your staff that fits snug on the head. This can be fixed on the head and doesn't need to be adjusted once it is on. This limits cross contamination (by touching) once milking commences. 5. After milking each teat should receive a post-dip immediately after milking to reduce the risk of infection. It is considered best practice that the teats be dipped within 30 seconds of cup removal. The body or udder should not be sprayed with water for at least 5 minutes after cup removal. Each cow should be discouraged from lying down because the streak canal stays open for about an hour after milking. If the animal lays down, it may result in contamination or infection of the open teat canal. Experienced RAWMI-listed producer and farmer educator Charlotte Smith shows how to prepare the udder before milking in this video. These procedures may sound and look easy enough, but it is hard work to do this consistently every day of the year. It requires diligence to perform each of these crucial tasks repeatedly. The individual dairyman's reputation is at stake, as well as the livelihoods of everyone working on the farm. Taking the essential care during milking is non-negotiable. Refresher training in risk reduction may be a good strategy if the owner sees a gradual increase in bacterial numbers. That is where record keeping can be very valuable. It is best practice to only milk cows that are in good health. If there are cows with a fever, udder infection, unusual discharge, lesions on the udder or diarrhoea, the milk is best not included for human consumption. Abnormal milk is best disposed of in a sanitary way, and animals producing milk not fit for human consumption are best given an identity mark. If an animal has an infected udder that goes undetected, it can transfer that infection to many other animals through successive cluster attachments. The milking unit/cluster has to be frequently sanitised between milkings in a bucket of disinfectant water, as in the image above to the right. Food Standards Australia New Zealand's Guide to the requirements for raw milk cheese in Standard 4.2.4 page 16 details their requirements relating to non-conforming milk. The cleaning of the milking equipment is a significant aspect. It is crucial to have access to both hot and cold water in the dairy, not somewhat warm water. The entire milking unit / cluster, especially the teat cups, have to be sterilised in disinfectant water directly before and after milking each cow. At the base of the teatcup cluster is a display window showing milk flow attached to the claw. It is important for parts like these to be dismantled and cleaned in a bucket of disinfectant water because bacteria can accumulate under the rubber ring between the two pieces and affect milk quality, click on the image above to enlarge. Allow the claw to hang upside down to drip dry of any access water. The cleaning of the standard pipeline system for raw milk production is generally the same as for raw milk produced for pasteurisation. Food Standards Australia New Zealand's Guide to the requirements for raw milk cheese in Standard 4.2.4 page 17 outlines that every dairy primary production business are required to have a cleaning and sanitising program. It also states: "The effectiveness of the cleaning program should be monitored by regular physical checks of the milking plant and by monitoring microbiological test data (e.g. total plate count, coliforms)." In this video, Charlotte Smith shows how to clean a mobile milking machine typically used in micro dairies. See the risk category Milking Area Management for more information. 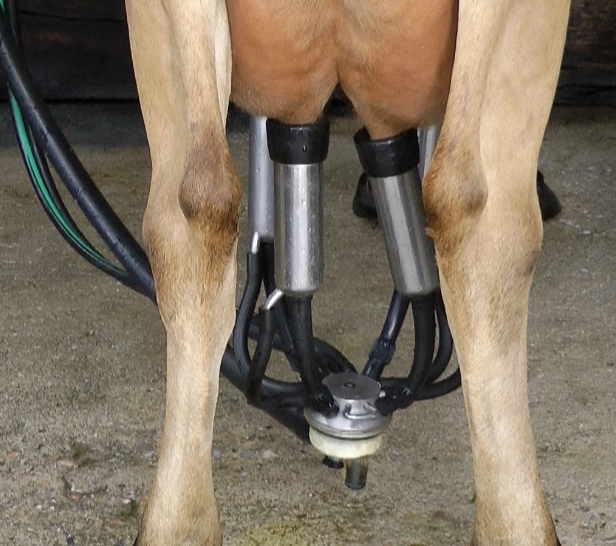 Image: A mobile milking machine typically used in micro dairies, click to enlarge image. To see how they work in action, watch this video. It is important to keep a written set of instructions where milkers can access this information with ease. A list can be printed on A4 paper, laminated and put up on the wall or door of the milk room, so nobody has to worry about forgetting important routine tasks. An equipment-check schedule can help employees stay up to date with the checking for leaks and general functionality. Certain parts need to be often replaced, like the in-line filter in a pipeline. If not replaced regularly components like these will become a risk, see an example here. Longer filter time will directly correlate to total bacteria count. Milking liners also need to be replaced, preferably before cracks start appearing in which bacteria can grow. A milking hygiene routine checklist, like this one, will help eliminate the possibility of specific vital tasks being neglected or forgotten. It will help to grow effective and consistent habits. In the RAMP these are called Standard Sanitary Operating Procedures (SSOP); they are a written procedure that requires extra steps. Cleaning the entire teat with pre-dip, for example, is just one of the steps that is routinely done but if it is not properly done as in the checklist, there can be ramifications. To learn more about SSOPs and how important they are from a business point of view, see the article Standard Operating Procedures for producing raw milk. Checklists document annual, monthly, weekly and daily management practices. In the raw milk dairy, it is important to cultivate mental alertness and attention to detail. Having easy access to information helps staff and the dairy farmer to stay on top of the game. Performing routine milking tasks adequately will make a big difference in achieving the low or not-detectable bacterial counts required. "Consistent inputs equals consistent results." Many of the issues not discussed in this risk category can be found in the SOP article or in the other risk categories. When cows enjoy a 100% pasture-based diet, many risks associated with feed are automatically eliminated. The chance of finding pathogens in the manure of a healthy cow who enjoy remineralised grass and hay, from regeneratively farmed systems, is minimal. Robotic milking machines are becoming increasingly popular around the world, and even raw milk dairies have implemented them. The Waldo Way Farm in Texas installed one in 2017 that allows the cows to walk into the system that operates 24/7. The robotic arm cleans and milks each cow and tests each batch of milk that comes through. It is not sure how risky this is, but so far it seems to be going well thanks to pioneers Ris and son Trenton. For more see the information and videos at the bottom of this article. Food Standards Australia New Zealand's Guide to the requirements for raw milk cheese in Standard 4.2.4 page 18 states: "It is recommended that automated (robotic) milking systems and novel milking systems should not to be used for milk intended for raw milk cheese unless the design has been submitted for assessment by the enforcement agency." According to a New South Wales DPI post in October 2018, there were 41 Australian farmers operating automatic milking machines in Australia. They were in every dairy region, milking anywhere between 110 and 900 cows, in pasture-based systems or in barns.